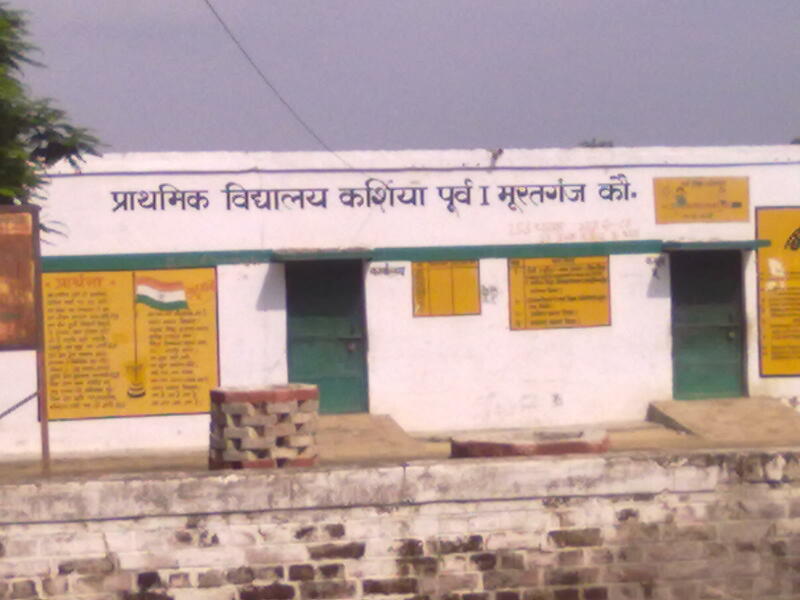 Kashia Purab is a village lying on the western part of Pargana Chail. 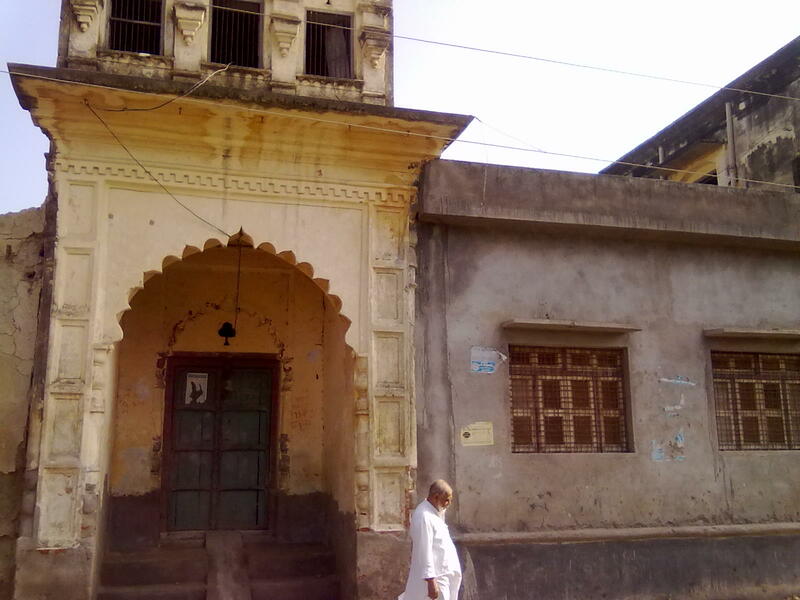 Muratganj a market-place is in fact a part of village Kashia which lies on the Grand Trunk road about 34 kms from Allahabad. There are two villages named Kashia. 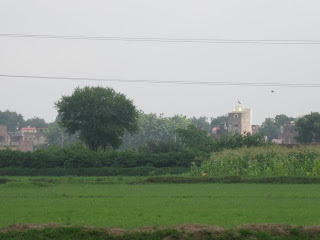 The one I am talking about it known as Kashia Purab (East) and there is a second on the GT Road few miles west called Kashia Paschim (west).Both are large villages. Kashia is one of the eight villages populated by Bukhari Naqvi Syeds of Pargrana Chail. 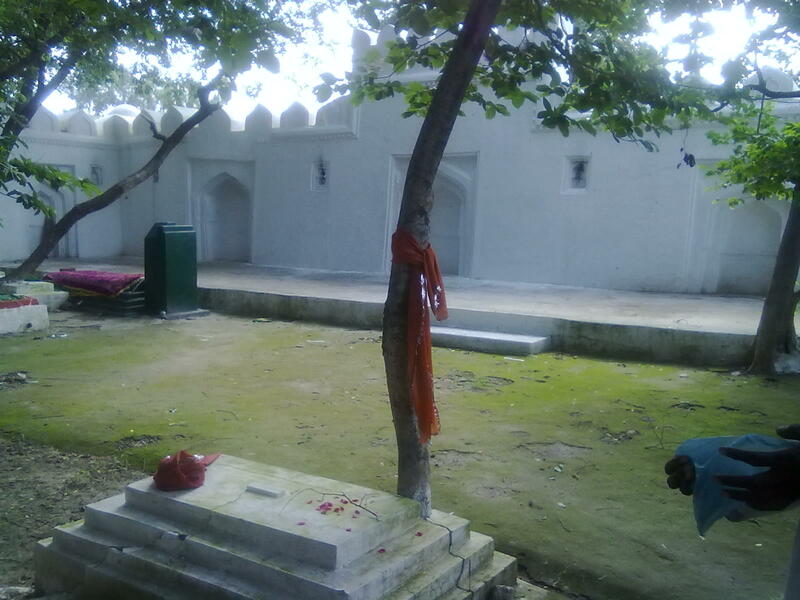 As I have stated earlier about Qazi Husam-ud-din Bukhari of Parsakhi that he divided his reward-villages among his eight sons. 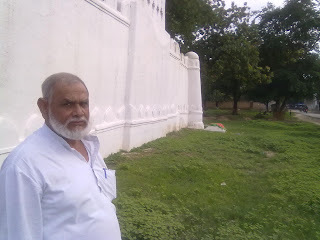 His son Sayyid Muhammad Lahuri inherited BadaGaon in this distribution. 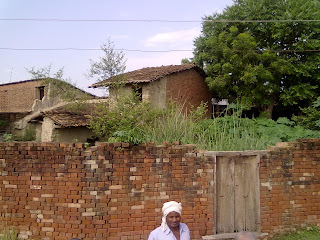 He lived in Badagaon. He had a son named Sayyid Naseerudin and two grandsons Sayyid Usman and Sayyid Yusuf. This Sayyid Usman left Badagaon and took Kashia for his abode and ever since his descendents have been living in Kashia as Zamindars of the village. 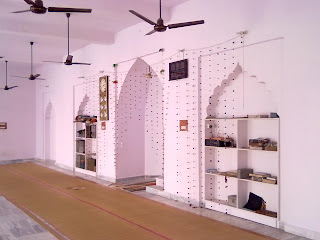 Sayyid Usman is the ancestor of the Saadat of Kashia. Interstingly earlier than this migration ,one of the sons of Qazi Husamuddin was already residing in the same village , the grave of Qazi Azeemuddin Urf Asadullah son of Qazi Husamuddin is in Kashia and we learn from Mirat al Jalali that he had no issue, it means Kashia was inhabited by the Qazis 600-650 year ago. It seems probable that after his death ,Sayyid Ssman the grand son of his brother came and settled in Kashia in place of Qazi Azeemuddin ? ??? 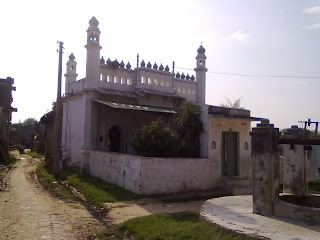 The above Sayyid Naseeruddin is the common ancestor of three villages namely BadaGaon, Nazarganj and Kashia while his tomb is inside the Rauza at Kashia and thus Kashia assumes a important place in the history of Bukhari Syeds of Chail and it also signifes the importance of Kashia at that earlier date. It is a matter of research why did Qazi Azeemuddin come to Kashia or died & buried in Kashia and then why did Sayyid Usman migrated from Badagaon to Kashia and again , why did Sayyid Naseeruddin came and died in Kashia while his children were in BadaGaon ? Since Kashia was not among the initially distributed 8 villages then the question arises what prompted or attracted the Qazis to move to Kashia ? Unfortunately today we have no one to answer these questions. The only information we get is from Mirat al Jalali a book dedicated for the Bukhari Sadat published in 1918 by Sayyid Khaleel Ahmad Mindarvi. 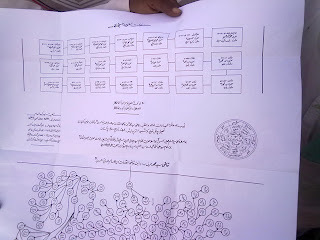 Although a detailed & upated shajra of the village has been published by Saiyid Afroz Ahmad from Karachi this year which seemed to me better than earlier versions. 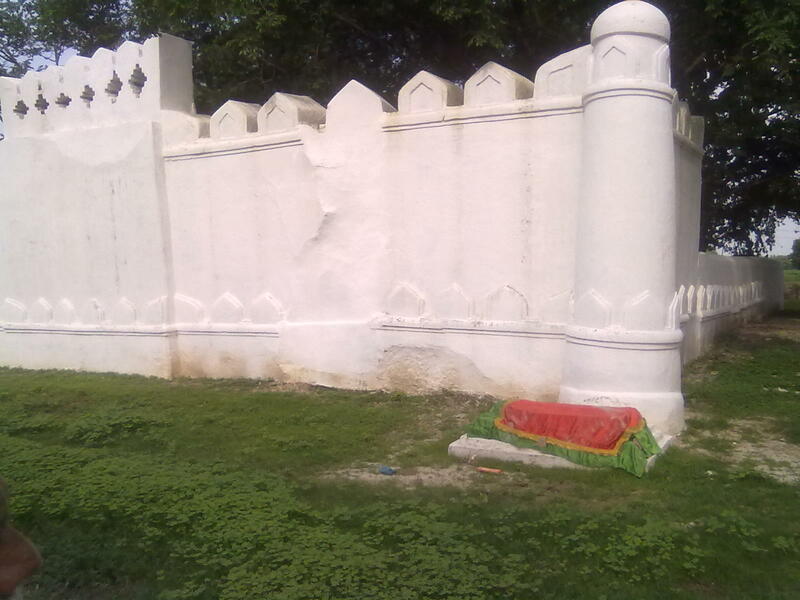 During the uprising in 1857 all the zamindars of Kashia were the supporters of Maulvi Liyaqat Ali, After re-capture by the British they were charged with rebellion and lands were confiscated. From that day onwards big zamindari did not come back to this village again. Although a few persons did managed to purchase some shares at different parts of time yet most of the residents of this village had to look for other options of livelihood. They started migrating for employment and then came the last blow in the form of partition of our country that jolted the entire community. A whole lot of educated class migrated during that period and the remainder to Allahabad during the late 80’s and 90’s …….now there are only few houses left as Yaadgar of the Bukharis. During my visit to Allahabad last week, I had a very busy schedule because I wanted to cover as many villages as I could but it does not always happen as you wish. I was supposed to reach Kashia around 2 PM whereas I landed there around 4 in a helter-skelter way. 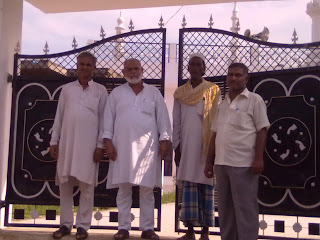 I was received by Mr. Shakeel Ahmad, ex-pradhan of Kashia who is now residing at Allahabad. 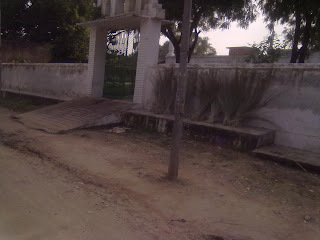 Before entering the village I spotted a very old structure with a wall similar to a rampart surrounding the structure. After getting down I saw that it was a walled enclosure and inside were the graves of Qazi Naseeruddin and his descendents.All the three persons that I named above are resting in this enclosure. 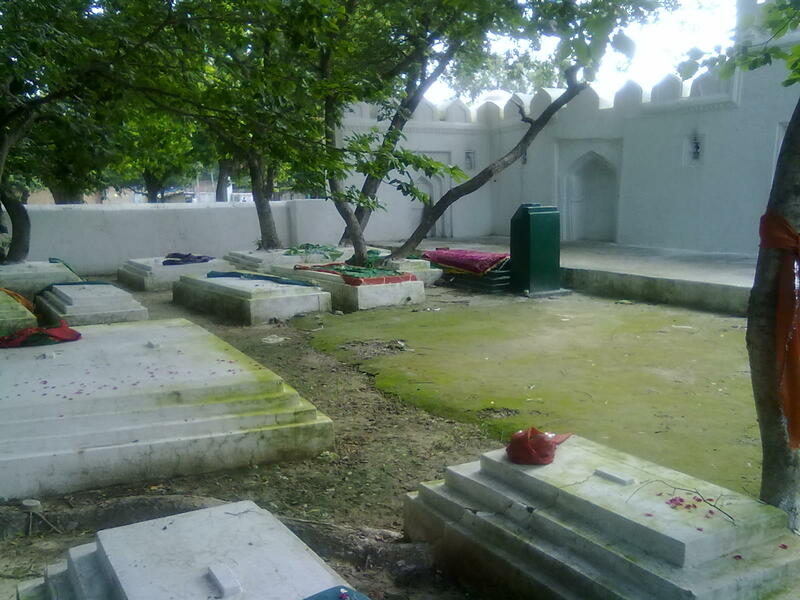 The flooring was concrete and no further space for further burial is available, it now serves as a memorial for the descendents of Sayyid Naseeruddin and local villagers come here to pay their respect. Indeed this wall is around five or six hundred old construction. 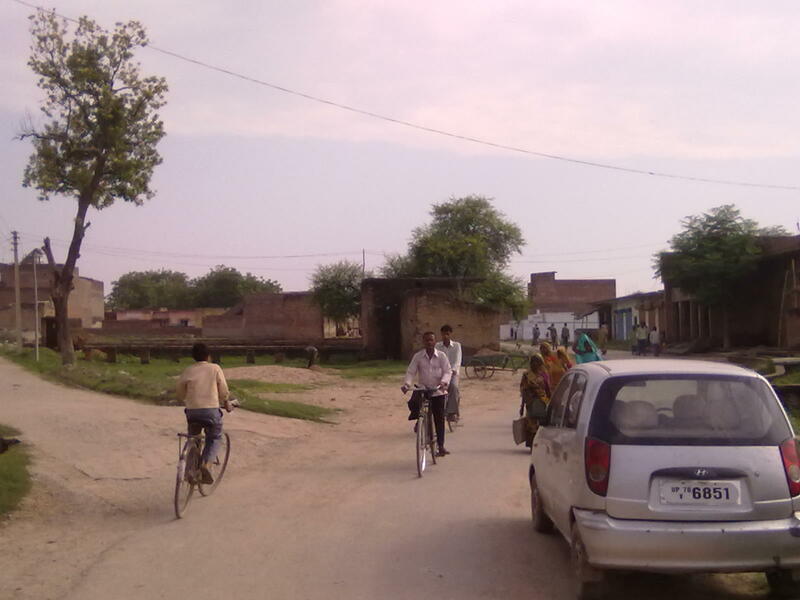 Going forward inside the village , we could see the shops on both the sides of road right from confectionary to cycle repairing , everything was at your disposal,it was buzzing with activity all along the road. 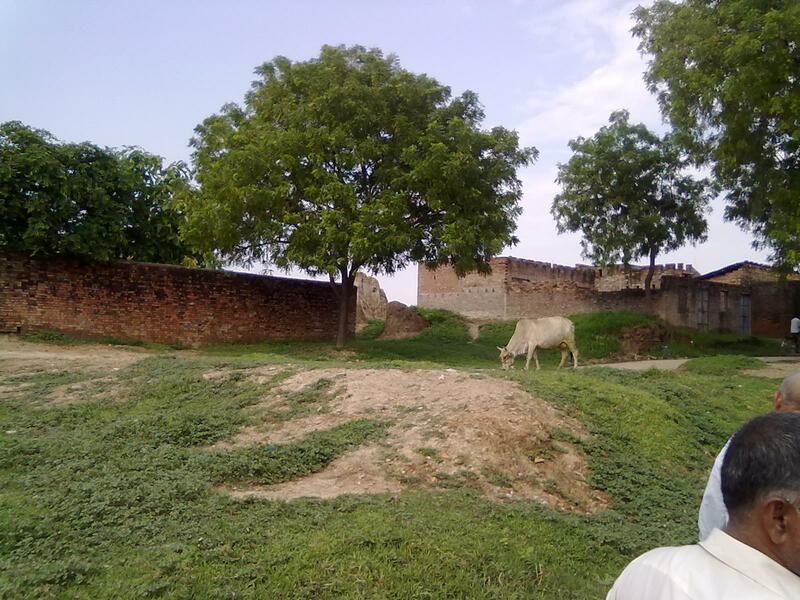 Here we saw the Eid-Gaah presently in use and then we took a round of the village ,walking through the alleys ,pleasantly surprised with the new mosque ,crossed the haunted houses, waded through the rubbles and remains of the destroyed houses of erstwhile zamindars………….. Ah ! Walking through the village, we found the same state of affairs as in rest of the zamindari villages in Chail, ram shackled villas, depopulated and abandoned houses crying for their owners, hanging roofs waiting for their final day ,it’s an agony to see through these famous villages in this deplorable condition but then again we must remember nothing is eternal. However there is a silver lining too, the new wave of religious revival has now maintained our mosques and opened madarsa in the major villages. Now people are aware and mindful of their past and trying to maintain themselves and of course their esteem! 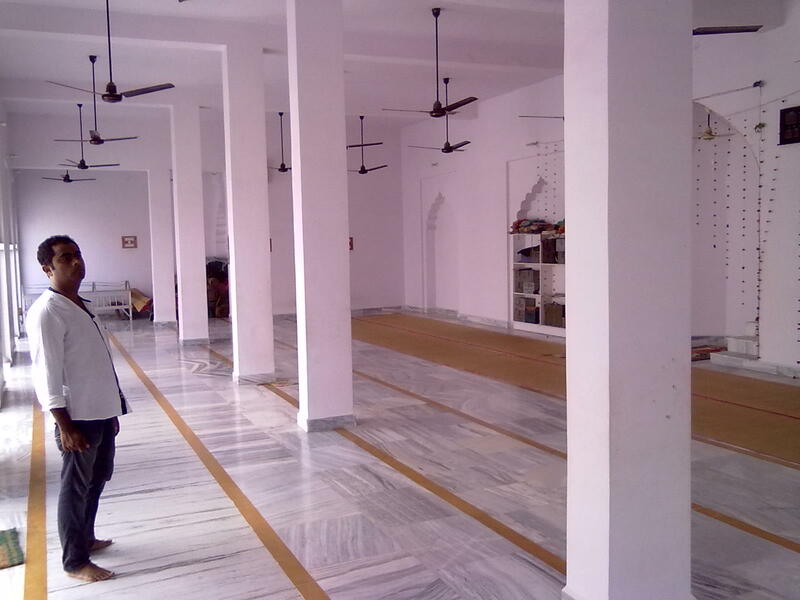 The people of Kashia have constructed a very fine and spacious mosque in the village. ! 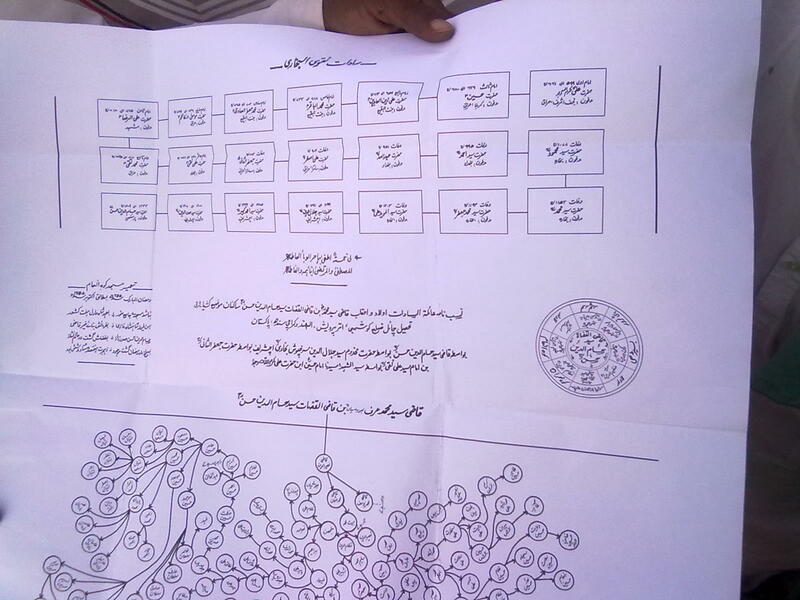 May Allaah swt guide them all to populate the mosque as well. May Allaah swt guide us all. Aameen! There is a madrasa too run by the same management. 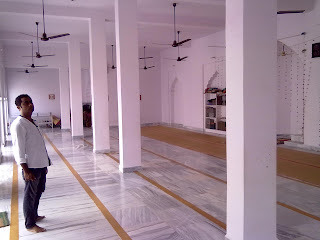 From historical perspective there is no other building except the Rauza which is certainly hundreds of years old. 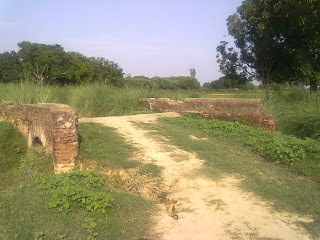 However there is one small bridge reportedly built during Sher Shah’s period the picture of which I have attached herewith. 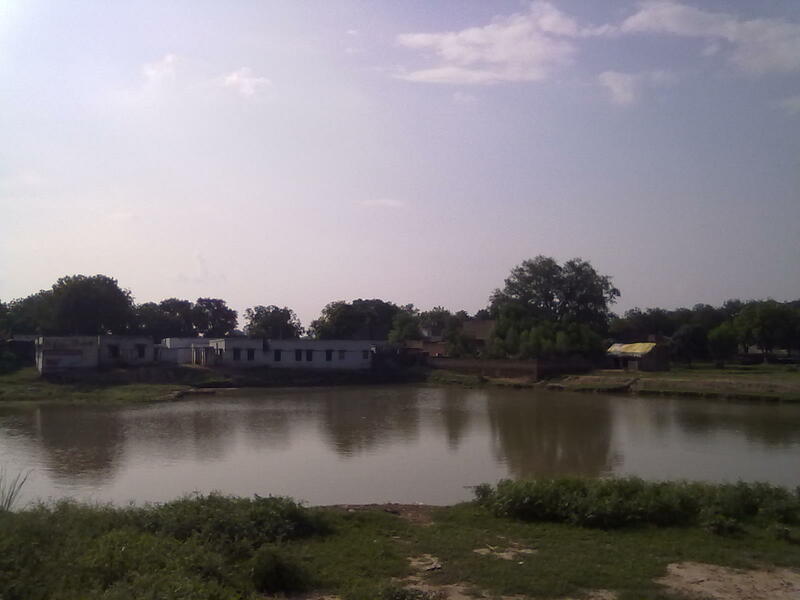 In the middle of the village there is a pond full of water that, according to the villagers, never gone dry and is too deep to be taken a dive in. If you visit the pond it seems to be at the level of your feet. But the populace should keep it clean and tidy ……..Isn’t it! 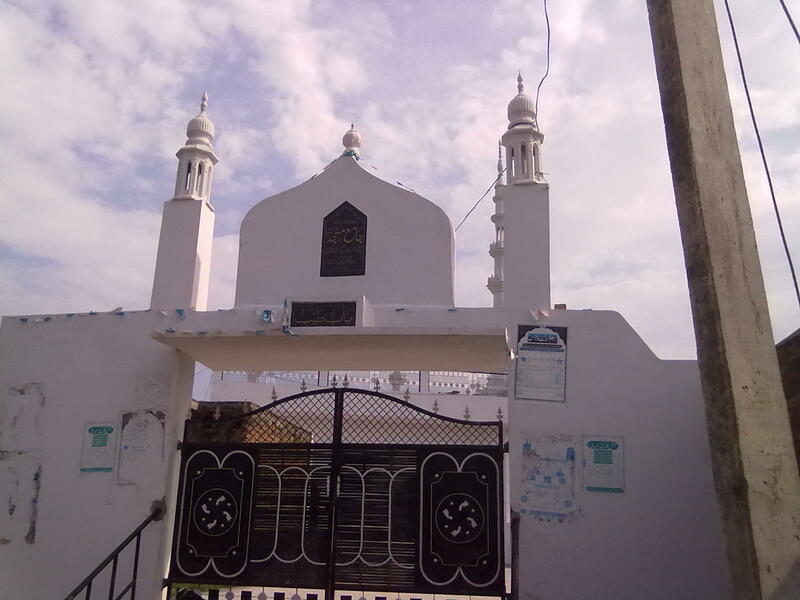 Amongst the well known names of Kashia in the past were Ahmadullah Sahib , Ibad ullah ,Iqbal Husain Afzal Husain , Hafeezullah ,Sifat Ahmad , Hashmat Ali , Mohammad Yusuf, Ali Husain ,Qadir Bakhsh, Mohammad tayyab , Moin ul Haq, Husain Ali, Salamat Husain Sahiban Marhoomeen. Other notables were Subadar Ameer-Ullah (Army) and Ameer Ali (UP Police) and of course Maulvi Wali Hasan.In the post-partition era Janab Laeeq Ahmad and his brother Khaleeq Ahmad Sb were the only persons known in adjoining areas. Jb Khaleeq Ahmad was a Mukhia (Head-man) of Kashia and similarly his son Shakeel Ahmad too served twice as the Pradhan of the village. As of today he is residing in Allahabad. I owe thanks to him for taking out his time and travelling from city to Kashia and then waiting for me in the sweltering heat just for the cause of his love for his village and ancestors. Jazak Allah! Again few lines started coming to my mind………..
At last best wishes for Ramazan ! I am very pleased that you visited Kashia by sparing time on a tight schedule and hope you were very wormly welcomed there. 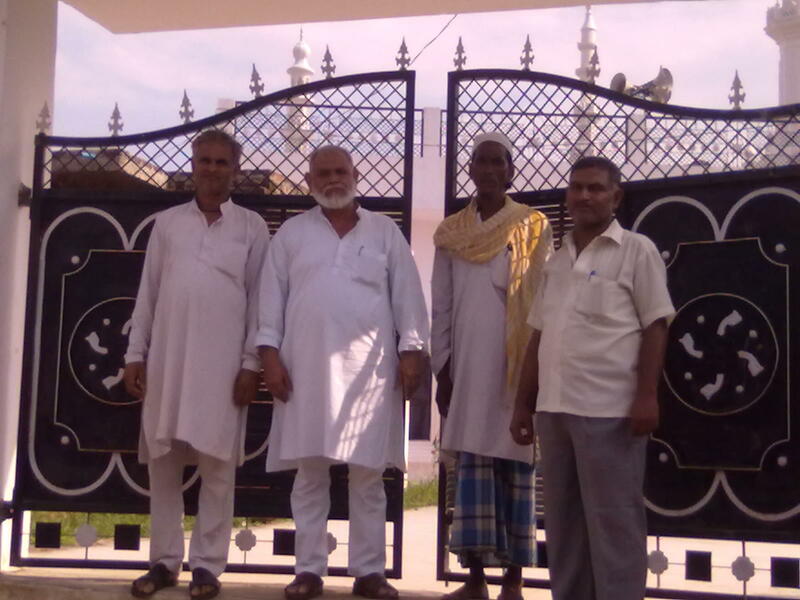 It is very comforting to see the present generation getting aware about there ancestral past and have started doing revival works in there respective villages and hope it will gain speed gradually. 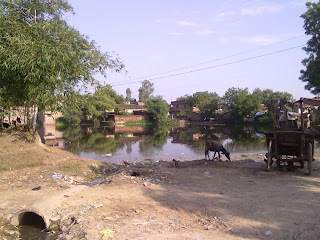 Kashia when seen keeping in view zaamindari class resident ,seems to be a mediaum size village but when the Kashia Village is taken as a whole ..Kashia Compreises of Kashia ,Shergarh,Chikwanpura,NadirGanj and the part along the G.T. road where a very OLD Petrol Pump is found [though people often mistake it to be a part of Mooratganj :-) ]. And I heard it from my father that kashia was second to Syed Sarawan in terms of population in Mooratganj block.now hold Ist position due to new settlements across the link road between kashia and Mooratganj.. 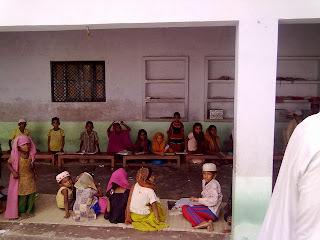 There is also a an Old govt.Aided Madarsa ( provides degree ) by the name of 'Hesham ul Uloom' . Qazi Hesam Aldin our famed ancestor. Again many thanks for you commendable work !! mohsin bro u r ryte. 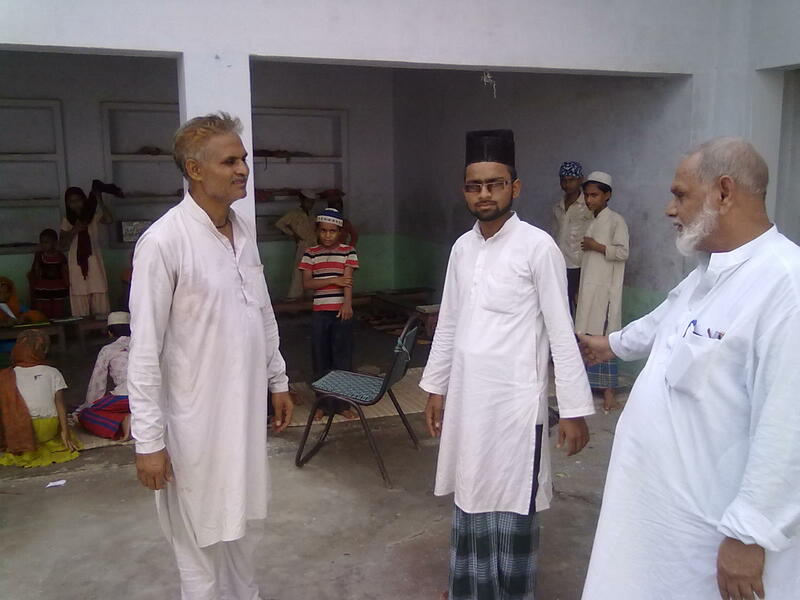 i was 5th to 8th in madarsa Hesham ul Uloom. n sir NAZMI was my teacher. khalid bro plz update more info about kashia. IMRAN AHMAD nephew of GHULAM MURTUZA AND GHULAM MUZTUBA (TUBA). HEAD OF VILLAGE KASHIA.